The best butchers block I have had in a good while....wonderful antique four foot block on a pine double drawer base. 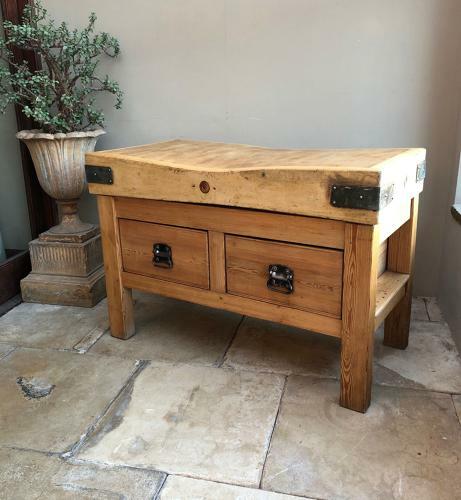 The base is identical both sides and the drawers pull through/open from either side ie there is no back to the piece making it a perfect centre piece as it is a good height too. The drawers are dovetailed and have the wonderful original iron handles. Great colour. The individual maple squares show well and have a great colour. The base is sturdy with no worm. All very clean and ready to use in a kitchen. The base was heavy for me to move and photograph but the last photographs so the other side is the same and the ends. Heavy and so Collection or Courier £90 UK (not including Scotland).